I'm not quite sure what you mean by a "nap". In English, this usually refers to the fuzzy appearance of a cloth finished that way. It can have a direction and a cutter will make sure that the nap runs in the same direction for the entire garment. The arrow you show seems to refer, however, to the waist. In German and in French (and probably other European languages) it is called the "taille", but perhaps in Danish it is called the nap? The location of waist and button point are not considered to have anything to do with balance which in garment cutting has quite a different meaning. In fact, the buttoning point can be changed during the fitting according to taste, and there is no rigid dogma about the buttoning point having to be located exactly at either the fashion or natural waist. 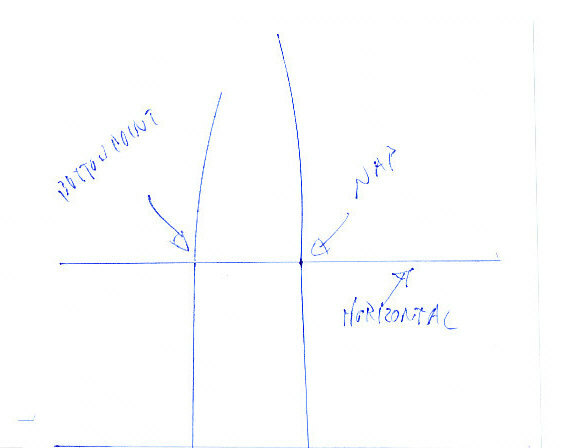 Balance, nap and buttoning point might not be the right words here. I'm talking about the waist, or the most narrow part of the jacket. If you look at a jacket from the side, how should the waist look like? There's probably more than one answer to this, but I prefer the look of a waist that is horizontal. Sometimes I see jacket, where the back waist is lower than the front waist. It looks like poor cutting to me, but it might just be a difference in tastes? Technically Gruto is right, hence the term "Balance". The waistline of the garment should equal that of the body. To do so the tailor/ cutter has to take some additional measurements, a process that is described Here. Text is in German, but the pictures explain a lot. Have a look at the tailor's coat, which is very well balanced. Although tight he can move well, which is due to the side panel following the shape of the body around the arm. Anybody else like the sleeve? This subject might be worth a thread in the Cutter's forum....? Yes, the length of waist is an important measurement, although, I think this can be changed according to fashion on lounge coats as well as body coats eg for a drape cut Whife shows that the fashion waist should be lengthened. I also have one page from Die Zuschneidekunst showing a lounge jacket with a Glockenform - high waisted cut very skirty. However, unless I have misunderstood, Gruto is talking about the buttoning point, which does not absolutely have to be placed precisely on the fashion waist that the coat has been given. Three button lounges and button-three reefers are examples where the buttoning point will always be higher than the fashion waist. I always thought that 'balance' referred to symmetry of the garment - an overall architectural requirement. Elements, like: the hem of the garment should hang [parallel] to the floor, regardless the angle of the natural waist or the tilt/incline of the pelvis, etc. So, with a stout figure, extra length is required at the CF of the garment in order to drape over the belly. When laid flat, it might look strange. But, when the garment is on the body, the hem is [parallel] to the floor. - the arms, should hang, naturally, not pulling from the cap - even if one arm is rotated higher or rolled forward compared to the other. - the shoulders should be evened out, left-to-right, with the use of pads, etc. - weak/sunken chests should be filled out with the use of canvasing and flannel, etc. ... and, Jeffrey's recent dilemma: waist suppression. While this can be a style detail, I typically like to keep the waist in visual proportion with the overall figure. That's my aesthetic. Every maker has their prerogative. In other words, the understructure and technical execution of the garment should make the figure - considering all its natural imperfections - appear symmetrical and visually balanced, overall. But, when the garment is on the body, the hem is perpendicular to the floor. My clients are usually standing up during fittings, not lying down, so I like my hems to be more or less parallel to the floor. Half an inch longer in front, actually. See what I get for working like a beast and skipping dinner? 2 more hours, then a nice hot shower... and, then I shall be perpendicular! Oh... and I typically insert 1/2" of fullness into the front waistline, too. It seems to work for the majority of brands playing in the 25-35 market in North America. I always thought that 'balance' referred to symmetry of the garment - an overall architectural requirement....when the garment is on the body, the hem is parallel to the floor. I suspect the discussion is going way beyond what the OP intended - into the realms of overall structural balance, which has little to do with the buttoning point of a coat. Nonetheless, presumably by the hem being parallel to the floor, we are talking about lounge-Chester type coats, because dress coats are usually cut with the foreparts sloping on a downward angle, so that you cannot determine the balance of the coat by looking to see if the hems are parallel to the floor. Yet, balance is critical to the fit of a dress coat, which is utterly reliant on this for the coat to cling to the body of the wearer. As for the buttoning point and the relation to balance on a dress coat? - well, the dress coat doesn't even have a real buttoning point! I find that raises something of an interesting question about the use of overall lengths of front and back as indicator of balance on all types of coats - body coats, as well as lounge-Chesters. I am beginning to wonder if the length from nape to waist over front and back panels principally determines the front-back balance with the overall coat panel length from nape to hem being secondary in importance. As long as this primary determinant of front-back balance is met, the secondary measure can be somewhat changed according to taste, so that the foreparts can be made either equal to the back or slightly longer. Even though the overall lengths to hem of back and foreparts may be of secondary importance to the lengths to waist, exaggerations of the difference between the lengths to hem will still upset the primary determinant of balance. BTW, Gruto will correct me if I have misunderstood but I suspect that what the opening post is about is the internet forum dogma that you see elsewhere about how if a lounge jacket has a button point that is higher or lower than the point of maximal waist suppression, it is criticised as looking "imbalanced". The term "imbalanced" means "it looks funny" and its use here is quite different from the term used as a technical cutting term. However, the cutting term "balance" is such an explosively loaded term that it has caused this thread to veer off into a full blown technical discussion of "balance" used as a technical cutting term. Personally, I think that balance is the essence and sine qua non of cutting. That being so, I think if we are to have a discussion about what balance (cutting technical term) is, we need a thread devoted to it. It would be too confusing to newcomers to have a thread on such an important subject start off with a discussion of buttoning points. If you took the block pattern for this jacket and derived a new pattern from it with the buttoning point now at the waist, the new jacket would also be balanced (in the technical cutting sense) - provided the original jacket was well balanced. While I think the question of what (if not the buttoning point) determines the balance of a coat, is an interesting one - I think it would be prudent to start a new thread for that purpose. No. This is not true. Some of what Cabrera wrote is what I was taught in the sixtis, and he says to put the button 5/8" below. Other books say something else. Some sports coats will be lower than that. Some hacking coats the back waist is high in the back. The widest place on a heavy person is usually about 2" below the "waist" line in the front, and probably the best place for the button is at the widest place. The best place is found at the fitting and should not be so low that it binds when bending over or other movements. The waist line itself is not always on the level and can even zigzag. Balance is from the bottom of the armhole upwards. If you slide the back up on the side seams it is because there was not enough room or lenght for that part of the back above the armhole. There is also lateral balance, too. True. But I fear this thread is already quite confusing with "balance" being used in both a technical and non-technical sense. Some hacking coats the back waist is high in the back. I was not very clear, sorry for that. I was focusing on the waist only. Not buttoning point or balance. What I tried to ask was, if the the waist line - from a cutter/tailor's view - ought to be on the level 360 degrees? Greger says it can "zigzag". What does that mean? I think that if you view a figure from the side, (and drew a waistline) the natural and the most pleasing line for the waist will be a slightly curved line that starts at the natural waist at the back and drops slightly at the front. When drafting jackets, the basic waist construction line is a straight line on the pattern from back to front, but I would locate the front waist about an inch below that line at the CF, for average figures. The waist shaping I think should also follow that slight drop IMHO. Whether the button should be there or not depends on the style don't you think? but I think I understand what you mean- if you are putting a button directly at the waist front it should be slightly lower than the back waist when seen in profile. I make a lot of what you may call "period" jackets- and each period has it's own fashion waist where the suppression happens- it can be at, above or below the natural waist, and they can have 2, 3, 4 or even 5 button fronts regardless of the location of the fashion or even the natural waist, as seen in the photos in previous posts. Hope you post some pictures of some of these "period" jackets. I like seeing verity.